On Nov. 8, 2014, HPTA celebrated its 38th anniversary with free cake for everyone at the Round Robin and with return visits of three of our charter members from 1976. 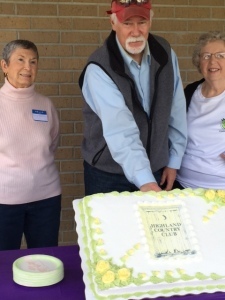 HPTA’s first president, Bettye Burford, cut the anniversary cake with other charter members Gaston “Louis” Bordelon and Betty Abadie. It was so nice to hear their stories from the beginnings of HPTA and to hear their compliments about how the organization has grown, but has kept its inclusive, inviting and charitable culture for all these years. Thank you, Bettye, Louis and Betty, for your individual and collective visions that led to the creation and support of HPTA.